In the old days, people wanting to find out how to best get around by bike would have to stumble across a copy of their city’s printed bicycle map. Today, widespread access to mobile and online maps can do more than provide route-finding help for bicyclists: they have the potential to catch the eye of users looking for driving directions, but who happen to notice the bicycle icon on the right. Google could probably tell us how many people click on the bicycle icon, but my guess is that it is far many more than those who know that their city even has a bicycle map. In my last post I discussed the trend of making bicycle maps more intuitive to the user by mapping by level of stress rather than mapping by bicycle facility type. In this post, I look at online tools meant to supplement or replace their paper map counterparts. Until recently, bicycle-oriented online mapping tools that serve cities across the US and abroad have been limited. In a vacuum, a few cities have attempted to develop their own dynamic online versions of their bicycle map capable of routing. Each city ends up reinventing the wheel, and the tool doesn’t leverage the exposure that the global online map providers have. In the end, I think there is still a role for cities to play, but it will likely take the form of national and international coalitions to advocate for common data definitions and repository for the next generation of digital mapping tool as a basis. The first multi-city map was OpenCycleMap in 2007. The map focuses on labeled bicycle routes, with limited information on either the types of bicycle facilities or the level of stress that a user can expect when planning a route. The first multi-city mapping tool launched with routing capability was Ride the City in July of 2009 followed closely by bicycle routing features in Google Maps in March of 2010. Both Ride the City and Google have a custom bicycle map so the user can see facilities where they are being routed. MapQuest added bicycle routing capability in March of 2011 but only displays a standard street map without facility information. 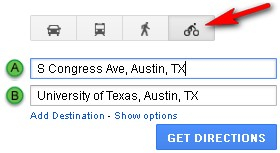 Yahoo Maps does not yet provide these features. The most significant flaw in current online maps is that, of the three low stress bicycle facility types, trails are over represented and on-street cycle tracks and bicycle boulevards are under-represented. The latter two are often portrayed as no better than streets with bicycle lanes or signed routes, respectively. The following three examples show how these facilities are represented. Portland has an expansive bicycle boulevard network (locally, they’re called neighborhood greenways). Compared to Portland’s paper bicycle map, online maps severely under-represent bicycle boulevards, despite being the most common facility type in the city and a significant contributor toward their impressive 6% mode share. New York has installed physically protected cycle tracks on several of its north-south avenues. Google has just created a new designation for on-street protected facilities. I used the edit feature to designate 8th and 9th Avenues as protected, but you can see that the mapping is glitchy and intermittently shows the correct dark green symbol also used on the Hudson River Greenway, a completely off-street two-way path. Ride the City has also recognized the different experience offered by cycle tracks, but unfortunately the symbology is too subtle to be clearly read. Unlike bicycle boulevards and cycle tracks, off-street trails are typically over-represented in online maps. The Google map below shows a variety of off-street facilities, ranging from sidewalks, nature trails, crowded trails with natural surfaces, to hard paved trails for exclusive bicycle use. In the Google map below, each of these trails attain equal visual weight even though some have limited utility for people on bikes. The Austin Bicycle Map does a much better job of representing the importance of each to the bicycle network. To achieve high-quality online mapping by bicycle facility type, universal, performance-based definitions for each facility type will be necessary. An example would be that a street would have to meet standardized motor vehicle speed and volume thresholds before being called a bicycle boulevard. What sets a bicycle boulevard apart from a local street with bicycle route signs and markings is the use of speed reducing and volume diverting devices where necessary to achieve acceptable speeds and volumes. Performance criteria would likewise be necessary to differentiate cycle tracks vs. buffered bicycle lanes and transportation trails vs. nature trail for use in online maps. Similarly, to produce online maps using a level of [traffic] stress methodology, as we do here in Austin, will necessitate moving towards universal definitions of level of stress. These could potentially be based on Peter Furth’s Levels of Traffic Stress (LTS) 1-4. For providers like Google to consider switching to LTS mapping, they would need a comprehensive LTS data set from which cities around the world could draw, a daunting task even for the world’s leading data collector. Ultimately, the provider of the tool must decide how they will render bicycle facility conditions by a facilities or level of stress approach. In either case, there should be a clear visual hierarchy that puts the lowest stress options at the top so a clear picture of low-stress network connectivity is presented to the user. The first step in creating this next generation of online multi-city bicycle maps will be the standardization of bicycle facility and LTS data definitions, certainly a task that should not be underestimated. Part 3 of this series will get into the nitty-gritty of the future of a standardized data platform that will support the next generation of online bicycle mapping, evaluation, and research tools that have the potential to change the way we interact with our cities. Read Mapping Comfort Part I: How psychological stress is influencing traditional printed bike maps. Nathan Wilkes is a bikeway planner and designer at the City of Austin, Public Works Department, Neighborhood Connectivity Division. He has worked on a variety of bicycle projects, including the recent Bluebonnet Street and Rio Grande Blvd green lanes in Austin.